When journalists and photographers wake up to a 7am announcement of an election date, there can be no denying the palpable buzz of excitement this creates. And when this happened on Tuesday and more of the day's events began to unfold, it did indeed look as though front pages the following day would read along the lines of 'Historic Tuesday for the North'. From the beginning, the daylong television and media coverage was optimistic. Sky News' ever-ready team frantically typed up news flashes throughout the major speeches, so that the bottom of their screen read 'Adams wants all guns out of Irish politics', and 'de Chastelain says decommissioning largest yet', in bright red boxes. Seasoned hacks raced across Belfast in quest of the latest press conference and local pubs saw their business soar as the invasion of the laptop took place. An atmosphere had been created, and editors were rubbing their hands in glee at the thought of the first positive headlines to emerge from the Six Counties in quite some time. But it was not to be. Late on Tuesday, journalists were forced to ditch their first, optimistic, drafts and sit down to write what varied between doom, gloom, denial and hope for their respective dailies, cursing Trimble for effectively ripping up their pre-set articles of celebration. So instead of large font, bold ink, 'New deal for North' titles yesterday, the print media had articles ranging from 'Deal in the balance' (Irish Times), 'Deal on hold' (Irish Independent), to 'Deal in crisis' (Irish News). In place of the photos that should have been taken - republicans and unionists shaking hands, people on the North's streets beaming at the news of the developments - were pictures of de Chastelain making his allegedly disappointing speech, David Trimble standing under a clock, (Trimble calls time on process, according to the Irish Examiner), and storm clouds gathering over Stormont. The slant adopted by the dailies varied also. The Irish Times blame game centred around the lack of clarity in the decommissioning process. 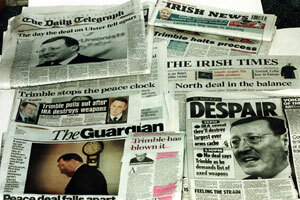 It's editorial, entitled 'Choreography of uncertainty' (following on the dance/choreography theme in all the papers), slammed the IRA's right of confidentiality. Ironically, it was printed directly across the page from an article by Fintan O'Toole - 'Self-regulation is not the answer', which claimed that journalists shouldn't be allowed to regulate their work, given that there is obvious bias. The Irish Independent was similarly critical of the decommissioning process on its front page. Its headline - "Deal at arms length", set the tone for the front page article, which claimed that Sinn Féin wouldn't budge any further and that "if republicans agree to waive the confidentiality clause it could pave the way for a deal to be revived". Its coverage inside was somewhat fairer. The photo of Trimble and the clock was accompanied by the caption - "Trimble stops the peace clock". Miriam Lord revealed that on the way to Belfast, Bertie Ahern's plane was struck by lightning - an ominous sign of events to come. The paper's article on the forthcoming elections stated that Sinn Féin is now in a win-win situation, and that Trimble may be facing political oblivion. Dan McGinn carried on the election theme in the Examiner, predicting that Sinn Féin should pick up more seats. While also begrudging of the so-called lack of clarity on the arms issue, the paper did carry a large printed quote from Adams asking, "When one party unilaterally moves to end a sequence, how can this be put together?" The Guardian's Jonathan Freedland let rip into Trimble. Stating that Adams had done his part and delivered an extraordinary speech, Freedland added that Trimble had left everyone exposed. "It all counts as a tragically wasted opportunity. There are not many conflicts in the world where one side renounces violence and scraps its weapons. Unionists should think of those trouble spots where, unlike today's Northern Ireland, bombing, killing and maiming still happen every day and realise what a chance they just blew." He accused Trimble of turning the Ulster Unionists into a "Me too" party, a pale imitation of Ian Paisley's rejectionist DUP. The Guardian also printed the Trimble/clock picture. It carried the header - "It was to be yet another historic day in Northern Ireland - a day that would go like clockwork. But the clock stopped when David Trimble rejected the IRA's latest offer." No 'dancing' around the issue of whether the deal was in the balance, on hold, or in crisis, for this paper. "Peace deal falls apart," its front page screamed. Inside, it believed that there had been three positive developments. Firstly, that anything happened at all. Secondly, that Sinn Féin and the unionists had led the initiative, not the British and Dublin Governments. And finally, that before Trimble put the brakes on, both sides had shown that they could work well together. The Irish News carried the most despondent coverage. Based in the heart of Belfast, the case could be made that its journalists were probably the most hopeful that events would follow through to completion, and not just from a newsworthy point of view. While its front page carried a humourous cartoon of David Trimble in a ballet/superman outfit, leaping into the arms of General de Chastelain, then the two falling through a trap door, inside, the frustration felt by its contributors was obvious. Brian Feeney lashed out at Trimble and his "If I don't get what I want, I'm taking the ball and going home" attitude. He pointed out that Trimble couldn't have attacked the IRA over the decommissioning procedure, because he hadn't negotiated transparency with them, and that was why de Chastelain got the brunt of his blame. In fact, Feeney added, Trimble had negotiated and agreed to the decommissioning procedure that was followed on Tuesday. But sure when did that ever stop Trimble from backtracking? An editorial carried a more positive message: "The road ahead may be rocky, but we have the direction right." At least, it claimed, there was a now a blueprint for developments. So, much like the message espoused by many of yesterday's papers regarding Tuesday as being a day of spin, hype and hope, much of yesterday's media was awash with spin, hype and hope. The headline so sought after by editors, nationally and internationally, will have to wait for another day. For now, the blame game continues, but finally, the fact that the unionists are holding up progress is beginning to seep through to even the most conservative newspapers. There is hope after all.